1 September - A dry and sunny morning to start the new month, although it is more cloudy this afternoon. 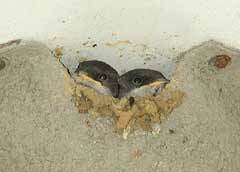 I spent some time watching the House Martins this morning, and I caught a first glimpse of a chick's beak, although I didn't manage to get a photograph. This picture shows mum(?) taking time off collecting insects to do some maintenance work on the entrance. Perhaps the morning sunshine had encouraged the insects to fly - the parents were bringing food more frequently this morning. As usual, getting a picture of them arriving is quite a challenge. This image shows one having to abort its approach at the last moment as the entrance was blocked by the rear end of a chick! 2 September - A lovely, sunny day with temperatures over 20C this afternoon. Perhaps a bit repetitive, but two more Martin pictures today. I spent about an hour up my tower this afternoon, but timed the start very badly. Having put the camera into position I looked up and there was a Sparrowhawk circling above the house. It was there for a few minutes before it headed off east. 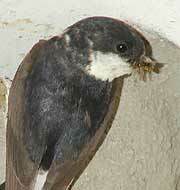 It was another 15 minutes before any House Martins appeared in the sky above us. I caught sight of chick 'front ends' a couple of times but this is the nearest I got to recording one, as one of the parents arrived with food. You can just see the top of its head! 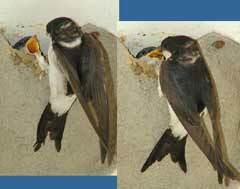 In the large image you can just make out the adult's feet in the shadows, raised up in front of the body and poised just under what appear to be a pair of insect wings, ready to grab the nest entrance. Another rear view of a chick that has just deposited a faecal sac, which is caught by the flash as it drops down to the porch. 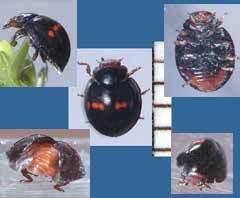 The Orange Ladybird pupa that I photographed on 22 August emerged during last night, as did several others. 4 September - I'm afraid that yesterday was rather lost to my CFS, and today hasn't been much better, which is annoying as summer has well and truly returned. It has been sunny, and very warm. I did spend a few sessions up the tower, and the time was rewarded by sights like this one. As you can see, the chicks are now starting to look out, at least two of them are when the parents have been away for a long time. In the large image you can just make out a tuft of down at the side of the left-hand chick. Several times, the Sparrowhawk appeared on the scene. On one occasion the panic calls of the House Sparrows was the signal for a whole group of House Martins to become very vocal in the area above our house and garden. 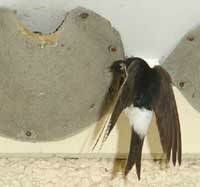 After that, neither our nest, nor the one across the road was visited for over twenty minutes. The Martins also stayed away while the hawk soared in thermals above the neighbourhood. I think the hawk may well be a youngster. This morning, while we had breakfast outside, a small flock of House Sparrows shot into the Hawthorn right in front of us, with a Sparrowhawk just inches behind them. It collided with the tree, made no attempt to pursue the sparrows further, and flew off, back in the direction it came from. Even when the hawk wasn't about, feeding visits were widely spaced this afternoon, and as usual, when they did come they were over very quickly. These 'before and after' images are actually two separate feeds some time apart. 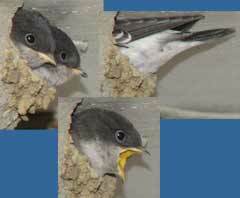 The difference in appearance of the necks suggests that the images are of the male and the female adults. By the end of the afternoon the chicks were staying out of sight, as happened when this parent turned up with, it seems, at least two insects in its beak. One of the insects has an elongated, striped abdomen. Could it be a hoverfly? Finally, two rear end shots of (I think) different chicks. The tail feathers show a bit of development since the last shots were taken, and you can see well developed wing feathers on the left-hand chick. Apart from the Martins, I haven't taken any photographs over the last two days, but I must note that during this time I have seen several very large dragonflies passing by, having been absent earlier in the summer. This evening, as I was putting this entry together, Sheila called me out to see a Hummingbird Hawkmoth that was on the Buddleia. This is only the second time we have ever seen one here in the garden, although I photographed one down in Cornwall in June (see entry for 12 June). Looking back in my diary I see that Sheila saw one here on 16 September last year. 5 September - Another sunny day, with the temperature this afternoon just a fraction of a degree below 30C! 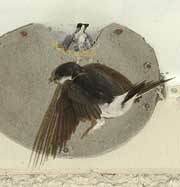 I spent just a short period watching the House Martins today. Unlike on previous days, I was concerned that my presence today was causing the adults some stress. I was in exactly the same position as on previous days - the only difference is the colour of the shirt I wore! 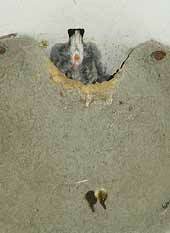 I wonder if it to do with the fact that the chicks are now appearing at the entrance, and as such are more exposed. I changed cameras, replacing the Olympus 2100UZ with the E-20 which allowed me to use a cable release from a more discrete position on the ground. 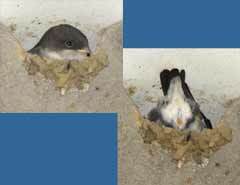 These are two images taken 'remotely' with the E-20 - the right hand one shows how the chicks disappear immediately after feeding as the adult flies away. This evening, while I waited in vain for the possible return of the Hummingbird Hawkmoth I watched the Martins in the sky above us. There were at least 24 of them noisily criss-crossing the sky as the sun set, and around 7.30pm they were joined for a few minutes by an even larger group from the west. I haven't see so many for a long time. After dark I spent a bit of time checking the Ivy. It will be a while before the flowers start opening, but tonight there were several green Lacewings fluttering among the leaves. 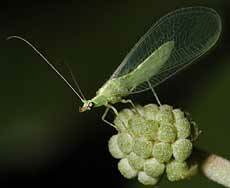 Last year I found a lacewing larva on the Ivy - I shall have to watch out for them during the rest of this month. I've been neglecting the plants in the diary recently, but I must include this one tonight. 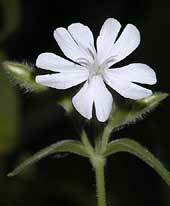 It is a White Campion (Silene latifolia), a flower that opens at night and relies on moths to pollinate it. Unfortunately there is just the one flower on one plant, which is a problem because the flowers are unisexual. This one is a female, and you can see the five styles. I have just read in one of my wild flower guides that it can hybridise with Red Campion. These are still in flower in the garden so it's possible we could get seeds produced. The plant is in a small area where I scattered a packet of wild flower seed back in the Spring, so I guess it came from that assortment. 6 September - Today there has been a brisk north-easterly breeze that has help to keep the place cooler, and as the afternoon progressed there has been increasing cloud cover. 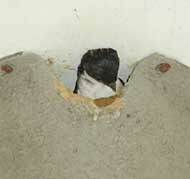 I spent some time watching the House Martins during the late morning, using the E-20 again and operating it via the long remote release. 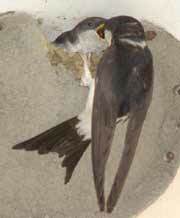 It was interesting to watch how the behaviour of our pair compared with the pair nesting across the road. I was relieved to see that they too often spent time doing close and fast flypasts without going to their nest, the behaviour that I thought must have been a reaction to my presence up the tower. 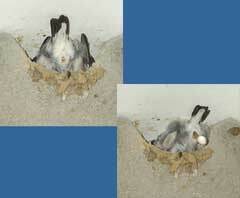 The chicks in our nest were often easy to see from the ground today. This head and tail pair of shots gives an idea of how much more grown up they appear in just a few days. If food arrives as a chick looks out the parent barely has time to get a grip on the nest before the chick is coming forward to meet it. While I sat and watched the nest, partly hidden by my son's Land Rover (we are looking after it for him!) a tiny, shiny beetle landed right nest to me. A close look at it suggested that it was a ladybird that I had not seen before, so I took it into the house for a closer look. 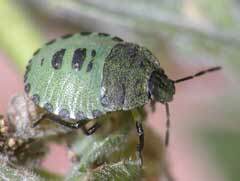 It turns out to be a Heather Ladybird (Chilocorus bipustulatus) which is found on heathland, especially on common heather - certainly not a garden ladybird. North-east of us are large areas of heathland (several miles away) so perhaps today's winds have carried it to our garden. Just about 3.5mm long, at first glance it is a shiny black beetle with a bar made up of partially merged red spots across its back. However, a closer look reveals that its head is red, and when it opens up its elytra ready to fly it reveals a bright orange-red top to its abdomen. While I've been distracted my the Martins, life in the back garden continues. Over the last couple of years an Elder has been growing under the shadow of the Hawthorn (I assume it's seed was brought in by a bird). 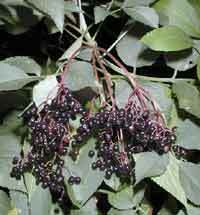 This year it produced flowers for the first time and they have now produced the first bunch of Elderberries in the garden. Just along from the Elder I spotted this nymph of a shieldbug on a Willowherb plant. I need to check which species it is - but not tonight. 7 September - Another dry day, although this morning started off overcast. I didn't pick up a camera during the day, but tonight I took this one picture of a bug, measuring about 10mm in length on the White Campion. I had gone down the garden to check on the Campion, on which the third flower is now open. I intended to try pollinating the flower using a Red Campion. 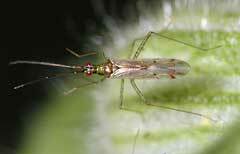 When I looked closely I saw seven of these bugs active on the plant. I'm afraid the picture is a bit blurred, thanks to my holding out the camera at arm's length! It doesn't appear in my guides, so I need to keep looking. 8 September - The weather continues good, but I got very little done today. 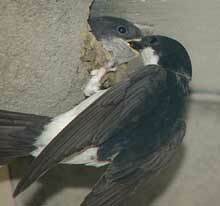 I did manage to take a couple of House Martin pictures to show the chicks' progress. There is now at least one chick on lookout duty through most of the day, not just looking out for the next food delivery, but constantly examining every thing around the nest. 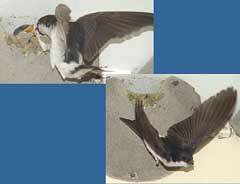 The rear view shows how well developed the flight feathers are now. I had hoped to get one of those great shots of a couple of chicks with mouths wide open as a parent arrived (!) but this was the nearest I could get today as one of the chicks lunges out to receive the food on offer.